1. Pull Over. As soon as you see emergency lights, or hear a siren behind you, pull over to the side of the road as safely and quickly as possible. Keep in mind, initially, the Police Officer may be going to another emergency and is not pulling you over. However, if you think you may have committed a traffic violation, pull over and stop completely. Be sure to look for an area that does not obscure traffic. If possible, pull off far enough out of the flow of traffic, so the Officer is not in danger of being struck by other vehicles. Also, try and find a lit or visible area, especially if you are in a rural or dark area, and use turn signals to indicate your intent to pull over. Do not coast. Come to a stop as soon as possible. If you do not, it may result in the Officer being unsure of your actions and suspect that you may have something to hide. 2. Keep your hands visible and do not make any quick or excessive movements. Officers are trained to suspect the worse and act accordingly. Irrational actions often receive strict reactions from Officers. Most likely the Officer does not know you, especially if you are in an urban area or where there is high traffic, like the NJ turnpike. 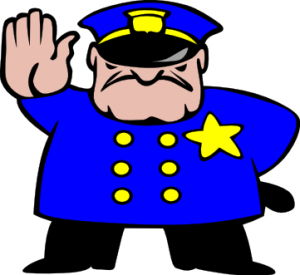 Excessive movements may cause the Officer to believe you have something to hide and may put the Officer on high alert. 3. Be Polite. Even if you will be late, can’t afford another traffic ticket, or have to use the bathroom, etc…, you must treat the Officer in a polite and respectful manner. Being nervous is fine, but rude is not. You do not have to smile, but saying “sir,” “ma’am,” “please,” and “thank you,” can go a long way. If you show respect you should receive it in return. Above all, never curse. That is one of the biggest forms of disrespect, even if it is in your regular vocabulary, it is not respectful to others, especially to an Officer. 4. Follow Instructions. If the Officer wants you to get out of the vehicle, he will tell you; otherwise, stay in your vehicle. If the Officer asks to see your license and registration, by law you must identify these documents to him or her. When you do not follow instructions, it leads to arguments and foul tempers on both sides; which may lead to leniency with the Officer and possibly even the Judge. Failure to follow instructions almost always results in a traffic ticket, rather than a warning, or sometimes even more serious consequences. 6. Do not lie or make excuses. Honesty goes a lot further than a quickly hatched excuse. Police Officers can easily detect lies, not only by what you say, but by your body language, and by asking various questions to see if you have inconsistent answers. If you lie to an Officer once, no matter how small of a lie it may be, it makes the Officer suspicious of your behavior, and anything else you say after that point will be viewed as a lie in the Officer’s opinion. 7. Talk as little as possible. Do not give elaborate stories or excuses, especially if you are hiding details. If you do not want to get caught in a lie (see step 6), than include as little details as possible. Some people also talk a lot when they are nervous. If you remember to try and keep your answers short and simple, you may appear more calm and collected. Also, remember that everything you say from the moment the Officer approaches your car, may be admissible in a New Jersey Court of Law. Additionally, silence is not an admission of guilt, but may result in the Officer being more suspicious and less accommodating. It seems like a lot to keep in mind; but in reality, you just need to remember to be polite and respectful to the Officer, while saying as little as possible. If you find yourself facing a traffic ticket in New Jersey, the steps above, should help minimize any consequences you may encounter.